Käsinmaalattu todella kevytimuinen bongi 7mm paksulla lasilla! 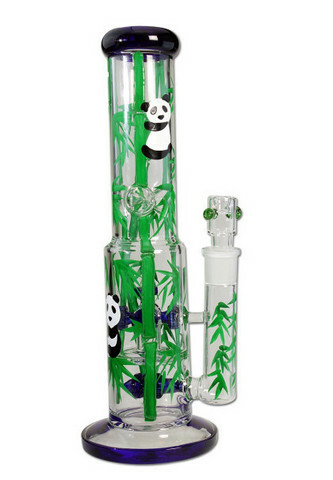 This percolator bong has a charming handpainted panda bear design particulary well accentuated by the blue glass elements. The color used is heat-resistant as well as the borosilicate glass. A 5 knob percolator, inline percolator with 3 showerheads and a 3-notch ice catch ensure a pleasant cooling of the smoke. The bowl is intended for herbs or whole flowers and has a integrated screen and lift-off handle/roll-stop. The mouthpiece is pleasantly rounded and the weight of the bong and its massive foot provide stand stability. But beware: The effect of this water pipe is not as innocent as it looks!